This past Saturday (1 December 2012), we had a special request from a group of visitors who were going to be in Wellington for a weekend. They wished to come in and talk to some of the curators and see the collection. This is relatively common but what was slightly unusual about the group was that they had come from Rapa Nui, otherwise known as Easter Island. Image of the famous Moai. Image reproduced courtesy of World Heritage Sites, on Tumblr. Rapa Nui is in the furthest southeastern part of the Pacific, one of the most isolated of the islands which make up the Pacific Islands. 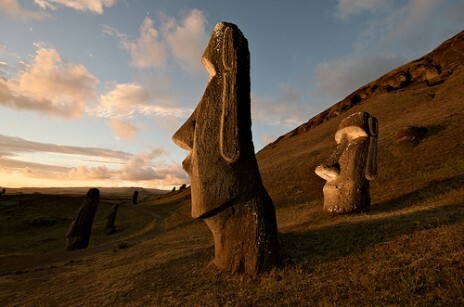 It is home to the magnificent moai statues and part of Polynesia. Rapa Nui is called ‘Te Pito o te Henua’ (the bellybutton of the world), is a territory of Chile and home to nearly 6, 000 people. On the island, Spanish and Rapa Nui te reo is spoken. Rapa Nui reo is very similar to Te Reo Māori and speakers of both languages are able to communicate. The request to visit came from Bronwen Golder, Director the Pew Environment Group Kermadec Initiative. The Pew Environment Group has committed itself to securing Government protection of the Kermadecs and as part of that commitment; it has sponsored the Kermadec show at City Gallery here in Wellington, and the Deep Sea Biology Symposium, held at Te Papa last week. As part of the Pew conservation work, they are looking to develop a relationship with the indigenous people of Rapa Nui, where the Pew Group have identified a proposed reserve. So they sponsored a visit by five Rapa Nui tangata whenua with the intention to bring these representatives to New Zealand for a quick reconnaissance visit, in preparation for a larger group visit next year. I have a special affection for requests from visitors from the Pacific. Many of the taonga that we care for in the museum have ancestral roots and resonances with many of the island nations throughout the Pacific. So when we have visitors from the Pacific to the Māori collection, I get very excited to hear their reflections and observations of the taonga Māori. 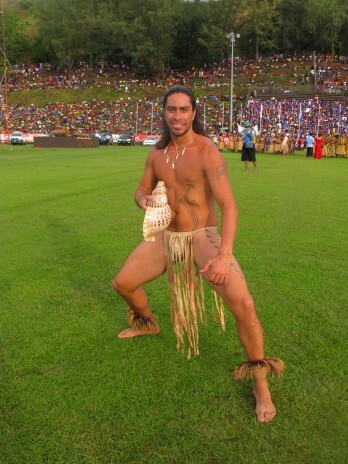 My own travels to two Pacific Festivals of the Arts (one in American Samoa in 2004, and the most recent in the Solomon Islands, 2012), I have been lucky to see the Rapa Nui island represent itself at the festival with dancers and carvers. Rapa Nui dancer, at the 11th Festival of Pacific Arts, Solomon Islands. Photographer Puawai Cairns, copyright Te Papa Tongarewa, 2012. 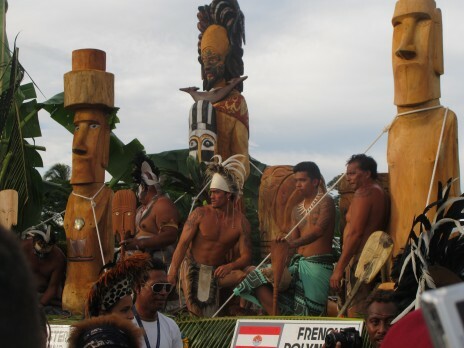 Rapa Nui carvings and artists, at the 11th Festival of Pacific Arts, Solomon Islands. Photographer Puawai Cairns, copyright Te Papa Tongarewa, 2012. For some reason, a ripple of excitement always went through the crowds when Rapa Nui presented itself in any of the parades. Whether it is the exotic, beautifully sensual nature of the dancing, the beauty of their dancers, or just the mystery of the people and culture of Rapa Nui, it is difficult to tell. In any case, Rapa Nui always holds some allure. But like many of the Pacific Island nations, their recent history has been fraught with protests over land and recognition of indigenous rights, and great efforts to protect, and revitalise their language and culture. 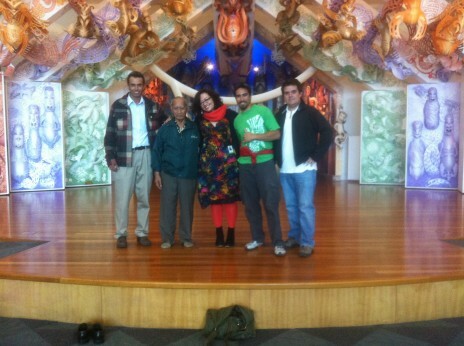 The visiting group and the curator, in front of Te Hono ki Hawaiki (Te Papa’s wharenui). Photographer Dr Susan Waugh, copyright Te Papa Tongarewa, 2012. Simon (Kuchy) Pakarati (left) – a Rapa Nui fisherman and Pew Environment Group leader on the island. Alberto Hotus (2nd from the left) – Chair of the Council of Ancients on Rapa Nui. He was described by the group as a ‘Walking Library’ of Rapa Nui lore. He was the elder of the group and was referred to as Koro. He last visited New Zealand in 1976, when he came to the Pacific Festival of Arts in Rotorua. Pedro Tepano (2nd from the right) –member of the Rapa Nui Council, who is responsible for revitalising Polynesian waka racing on the island. Ernesto Escobar (right) – the Director of the Pew Global Ocean Legacy project in for Rapa Nui and Bronwen’s Chilean counterpart. A group of Te Papa staff gathered and greeted the visitors when they arrived. We had to speak through Ernesto, who translated from English to Spanish for us. I spoke Māori and we all managed to make ourselves understood. But thanks to Ernesto’s indefatigable efforts, he allowed the conversations to flow quite easily. Te Papa has a few pieces in the collection with an association to Rapa Nui/Easter Island but when they began in the Pacific collection with Grace Hutton, Collection Manager Pacific, they were more interested in seeing material from other cultures. After the Pacific Collection, Mark Sykes (Maori Collection Manager) and I, took them into the Māori collection where we spent several hours going through the taonga Māori. Through our shared conversations and exploration of the museum, I found it remarkable how many commonalities there were between us. 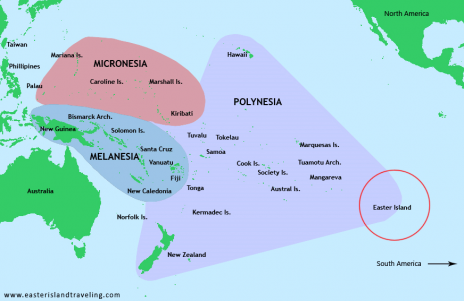 The Polynesian culture – even though spread across thousands of miles – has maintained a strong presence throughout the many different islands. I showed them examples of taonga, such as the tokotoko, and they recognised them immediately – having the same taonga in Rapa Nui – with the same name and same function. In fact, the phrase – “same, same” kept arising the whole time they visited. 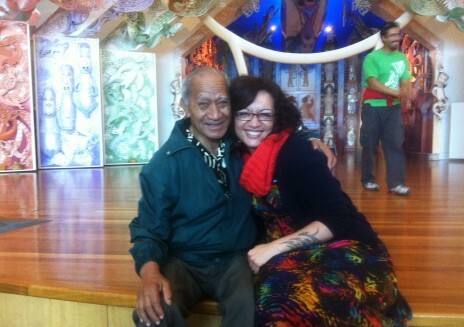 Koro and I would discuss a story or a taonga and inevitably end up saying “same-same” and then smile at each other in recognition of the ancestral connections which still endure between our two islands. We had similar stories, humour, and even body language. When discussing some of the bleaker aspects of both countries’ encounter histories; for instance, imperialism, cultural erosion, efforts to revitalise customs and practices – these were still points where we could share common experiences and struggles. It was amusing, poignant and endearing. Pedro’s pukana. Photographer Puawai Cairns, copyright Te Papa Tongarewa, 2012. Two places they took particular interest in, were the two whare in Te Papa. 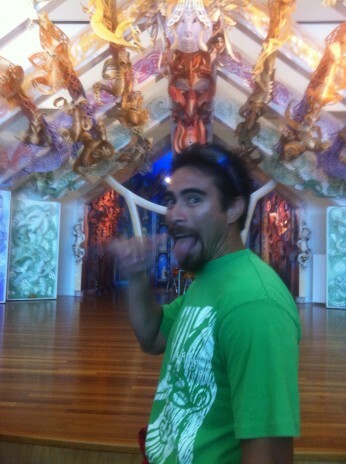 Te Hono ki Hawaiiki (pictured above in Pedro’s pukana picture) and the magnificent Rongowhakaata whare Te Hau ki Turanga. When I described the conflicted acquisition history of Te Hau ki Turanga and its negotiated return to Rongowhakaata, as part of the tribe’s Treaty settlement, there were nods of empathy and agreement that the whare’s return to its people was right. Once they left the Cable Street site, Dr Susan Waugh then took them to the Natural Environment storage at the top of Tory Street, where they spent a further two hours looking at specimens in Te Papa’s enormous NE collection. Petipeti! ka pai! All is well! These words came in pretty useful during the day, so many thanks to Reuben. If you want to listen to the sound of Rapa Nui reo, you can listen if you follow this link. I hugely enjoyed the visit by our Rapa Nui whanaunga (relatives) and do hope they come back to Aotearoa again. I found it a moving experience, listening to their stories, their struggles to bring their own culture back from the brink and to be given the recognition that many indigenous peoples struggle for. I applaud the Pew Environment Group for having the foresight in supporting the people of Rapa Nui to be involved with their efforts to raise awareness of the fragility of the environment and the unique species found within the Kermadecs and around Rapa Nui. In 2010, one of our staff wrote this intriguing blog about the toromiro tree, a relative species to the kowhai here in Aotearoa, used for Rapa Nui carvings. You’ll see that Aotearoa and Rapa Nui share more than cultural similarities. I look forward to their next visit! UPDATE: as a wonderful coincidence, this week two ocean-going waka from Aotearoa – using traditional navigational techniques and after four months voyaging – have arrived in Rapa Nui. Koro (Alberto) and me. Photographer Dr Susan Waugh, copyright Te Papa Tongarewa, 2012.